By Shelley Lacey-Castelot, ATACP, M.S. Once students with learning disabilities begin to take notes in class, their challenges with spelling, handwriting, simultaneous processing, and reading can overwhelm them. Even those who are good auditory learners can become flummoxed. For students whose handwriting challenges make note-taking with a pen too difficult, AudioNote is a good solution. It is available as an iOS app, an Android app, a Windows program, and a Mac program and can synchronize notes across platforms in the cloud. AudioNote does not synchronize recordings and notes by microdot as the Echo SmartPen does, but does synchronize by each line. The trade-off in precision can be worth it for students who simply cannot manage the handwriting task but who are proficient typists. I’ve found myself at meetings when I unexpectedly needed to take notes, and have been glad to be able to pull out AudioNote on my phone. The top contender is the Livescribe Echo SmartPen, a ballpoint pen and voice recorder combination that preserves synchronized digital copies of your notes and recordings. The digital recordings can be replayed, saved to your computer, and shared with others. When the class lecture begins to go too fast for note-taking, students can simply mark the spot on the paper, note the “big idea” and leave a large white space on the paper to fill in later as they listen to the recording. Students do not have to listen to an entire class; they can simply tap on the paper where they need clarification and listen in that place. Students tend to prefer the pen over some other note-taking technologies because they say it is unobtrusive and looks less different. 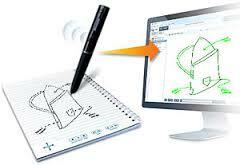 Handwritten notes can be converted to digital text for text-to-speech read-back. The Echo pen is recommended over the other Livescribe SmartPens because students can replay notes simply by tapping anywhere on the paper itself. With other versions, students need an iOS device to record to. Although not something parents generally acquire for their students, there is one more note-taking device that can be useful for all students in the class. The Smart kapp whiteboard, from the folks at Smart Technologies, is a very reasonably-priced electronic whiteboard upon which teachers can write and students can easily capture notes—in incremental boards, no less. So, rather than students having just a finished math problem in their notes, for example, they can capture steps of the problem to help them remember and understand the process to guide them as they work independently. Equally exciting for students, they can pair their smart devices (phones, iPads, etc.) easily and independently with the Smart kapp with an NFC tag or a QR code to capture the notes themselves discreetly and easily during class. It’s easy to use so teachers don’t have to change how they teach and students don’t feel different. Content can be saved as JPEG or PDF snapshots and stored in the cloud for easy sharing. Shelley Lacey-Castelot is the Director of Literacy Solutions in Oxford and Norwalk, CT, and is an expert in the evaluation and use of AT for students with LD and ADHD. She is also a member of Smart Kids with Learning Disabilities’ Professional Advisory Board.